Apologies for the slow updates: it’s been a madhouse over here! I’m excited to announce I will be contributing a piece called Eraser no. 2 to Dylan Languell’s collective show, Hole, in Richmond, VA. All the pieces will be exhibited in a pit that Dylan dug out and the art will be incinerated at the end of the opening. This is an incredible happening and I am honored to be a part of it! The next thing on the horizon is Heart of the Ghost’s LP Release tour starting April 16th in Columbus, OH. This is such a fun and inspiring group to play in. I’m thrilled we’ll be revisiting some of our favorite cities on this April run. You can see the full list at the “Shows” tab of this site or scroll down to read below. There will be more dates in May and later this Summer if we’re not playing your city on these dates. In the meantime, please take a listen to the LP at the Dagoretti Records Bandcamp. Scroll down for a sneak peek and the Bandcamp link!! As always, thank you so much for reading and listening!! See you at a gig!! An extra fun end-of-the-year update! The folks over at DC’s ROOM Collective asked me to contribute a mix of tracks I’ve been listening to recently to their Soundcloud. I had a blast doing this & I hope the result is to your liking! A quick note: this mix is probably NSFW as there is a fair amount of profanity. Thanks for listening & see you at a gig! It’s been a truly incredible few weeks over here! My visit to Seoul for Audio Trading Manual’s Arts Incubator was a truly reinvigorating and inspiring experience! A profound “Thank You” to everyone I met in Seoul for their hospitality & kindness. I can’t speak highly enough of the composers, presenters, artists, and, generally, people that I met on this trip in November. In other news, thank you to everyone who came to see Heart of the Ghost perform with my old friend Danny Kamins. It was a thrill to reunite on stage with Danny after 7-8 years since we last performed together and the sets from Amber Dunleavy & Arthur Harrison, Peter Redgrave, and Tee Tree Trio were a delight. It was truly a blast! First, this weekend I am rejoining Daniel Bachman & Forrest Marquisee on stage at Rhizome again to fundraise for Rhizome’s wonderful space and programming. Sarah Hughes, Jenny Moon Tucker, Thomas Stanley, and Khalid Thompson will all be sharing the bill that night and I’m excited to see sets from such local heavyweights. Second, I will playing a solo set at Amma House’s Festivus celebration in Alexandria, VA. This is sure to be a fun night and Amma House is always a great time! Thanks for reading/listening/paying attention this year & cheers to more of great music! It's been a wonderfully productive month over here! A week or two ago I spent 4 days on the road with Nagual (David Shapiro, Stefan Christensen & Myself) & Zach Rowden. It was a total blast: massive thanks to all the wonderful folks who set up gigs, played on bills and showed up to gigs! We were touring as quartet behind our new cassette release that is now available in the "Store" section of this site, Pidgeon Records' Big Cartel (HERE) or on the Nagual Bandcamp page (HERE). After years of playing with Zach, it was really a fun time to bring him into this context and hear him contribute such heavy sounds. I'll be rejoining Zach on a stacked bill at Rhizome on September 16th. He is touring with Henry Birdsey as Tongue Depressor and the mighty Cortex is rounding out the bill. I will be playing solo doing some modular synth material. I'm sure it will be a swell night and it would be rad to see some familiar faces. More info HERE. There will be more news soon I'm sure but until then, see you at a gig! Yesterday, I released a digital-only record of new solo synthesizer material on Bandcamp called 8 Miniatures for Modular Synthesizer. You can purchase it through Bandcamp HERE. All proceeds from the sales will go to Border Angels, a non-profit that provides immigration and consultation services as well as help prevent unnecessary deaths on the USA-Mexico border. You can find out more about their organization HERE. This coming month I will be rejoining Jarrett Gilgore and Luke Stewart on the road for a few days playing at Rhizome DC, Charlottesville, VA and Raleigh, NC. At the end of the month, I'm honored to hop back onstage with Marian McLaughlin to perform music from her new record at Lake Accotink in Virginia along with Jarrett Gilgore and Ethan Foote. Finally, the last show of July, as of now, will be with Nate Scheible and two incredible dancers: Aquiles Halladay and Shay Turner. We will be performing at Rhizome along with Mishpokhe Klang and Bashful Slasher from New York. All the information on these shows can, as usual, be found at the "Shows" tab of this site. Thanks for checking all this out & see you at a gig! May was a fun month of shows! This month I will primarily be dealing with recording projects. However, I do have one gig coming up this week with the mighty guitar duo, Elkhorn. Nate Scheible & I will be joining them in playing some old and new songs from their records. There are some other swell acts on the bill as well so roll through Rhizome on the 9th for some good, mellow tunes! Also, thank you to Renata Ocampo for this dreamy photo of Mark Cisneros and I playing duo at Dew Drop Inn recently! It was a fun gig and was great to see some familiar faces in the audience! Thanks so much & hopefully see you at a gig! It's been an awesome month of shows so far. Heart of the Ghost's most recent outing with Organix trio in Baltimore was really a blast and it's always an honor to share the stage with Jamal, Trae, and Jeron. Next up Xenga (Jarrett & I) will be opening for Chicago's own Eli Namay and Sarah Hughes' Coy Fish at DC's favorite venue, Rhizome. Thanks for listening and hopefully see you at a gig!! It's been an eventful few weeks over here! Firstly, I'd like to say a wonderful thank you to Bill over at Dusted for his great writing on Elastic Arts' Exposure Series. It's been a joy to read his writing & reminds me to extend yet another "Thank You" to the incredible hospitality of Dave Rempis, Paul Giallorenzo, and all the other incredible artists and volunteers involved. I'm also thrilled to announce that Nagual has a new release out on Miami's Hologram Label. Ultimate thanks to Chris for making these extended pieces a reality and for packaging the release so nicely! It's not up on Hologram's Bandcamp just yet. However, we have some artist copies that you can pick up in the "Store" section of this site. Lastly, there are some really wonderful gigs coming up this month. This Friday (5/11), I'll be playing with Brian Settles, Colin Chambers, and Mike Bowie at Jojo on U Street in DC. I'm also thrilled to rejoin Nate Scheible on double-drum duty this weekend. This time, we will be joined by two dancers: Aquiles Holladay and Shay Turner. I'm excited to see how this quartet turns out. We're be opening for the mighty Mourning (A) BLKstar at Rhizome on Sunday 5/13. The following Friday, Heart of the Ghost (Luke Stewart, Jarrett Gilgore, and myself) are opening for Organix Trio at Creative Alliance in Baltimore for their record release and we will be joining them after out respective sets for an expanded, sextet performance. There's more on the calendar as well. Take a peek over at the "Shows" section of the site for more info!! Thanks for looking and see you at a a gig! It's been a really fun and diverse month of shows! To wrap it up, I'll be playing with Mark Cisneros and Luke Stewart as the Low Ways Trio at Showtime Bar in D.C this coming Thursday (4/26). Sunday, I'll be rejoining Jarrett Gilgore and Luke for our unofficial tape release homecoming show for Heart of the Ghost. We have less than 10 copies left of the cassette so I highly recommend you stop by if you want to pick one up. Here is the info for that: Heart of the Ghost w/ Cunningham/Bucko Jr./Adams Trio, Hardhealth, Rhizome, Takoma Park, DC. Lastly, thanks to Sriram Gopal for this photo of the first meeting between Brian Settles, Luke and I at Jojo this past Friday. It was fun to stretch out a bit musically! The utmost thanks to everyone involved with the Heart of the Ghost Spring tour! It was truly an incredible experience to play with and meet such amazing people every night! We still have some copies of the cassette left which you can pick up from the "Store" tab of this website, if you are so inclined. Lastly, Heart of the Ghost returns to D.C. the following day on a bill with Hardhealth and the Cunningham/Bucko Jr./Adams Trio. There's no event for that up just yet but the "Shows" section of the site will be updated just as soon as there is. Thanks, as always, for reading and I hope to see you at a gig!! Before Jarrett, Luke, and I head out for tour, I'm psyched to be playing a stacked & eclectic bill in New Haven with Wendy Eisenberg, Zach Rowden, Nikole Jewell, and Kodak Fire. I'll be up there doing some more recording with Nagual & Stefan Christensen and we will be performing on this bill. It's always a treat to play Elm City so if you live in the area, come on out! You can find the event in the "Shows" section of the site. Heart of the Ghost goes on tour! I'm very psyched to announce that Luke Stewart, Jarrett Gilgore, and I will be going on tour the end of March. We'll be traveling through select parts of the Midwest and Mid-Atlantic. If you're in one of the areas on the poster below come check us out! Very psyched! See you at a gig! 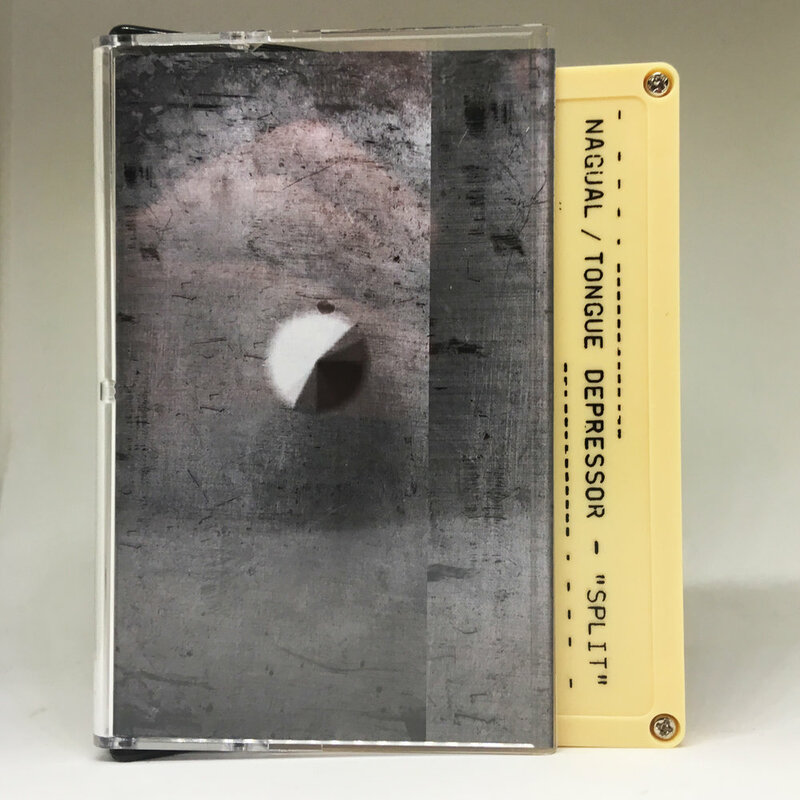 Nagual/Tongue Depressor Split Cassette OUT NOW!! I'm very psyched to welcome the Nagual/Tongue Depressor split cassette into the world! Nagual is David Shapiro & myself. This cassette showcases some rare duo improvisations. These improvisations are unlike much of what we have released thus far. Tongue Depressor is Henry Birdsey & Zach Rowden. Their side is a real treat. It edges into Henry Flynt-like territory with both performers playing violins but these two have the edge of two young contemporary improvisors. You can grab copies if you follow the "Store" tab on the left hand side. Tapes will ship out the next day. Take a peek through the other releases available there as well! David & I will also have these cassettes when we play on a bill with Zach from Tongue Depressor on Saint Patrick's Day in New Haven. Thanks & see you at a gig! This Spring has brought some really cool gigs my way! First, Low Ways Quartet will be performing in front of one of Janel Leppin's amazing weavings at Black Cat. This Sunday I'll be performing music composed by Dave Scanlon to accompanying some quilts & quilting patterns. This ensemble is packed with high-level local improvisors so be sure not to miss the gig this Sunday. Also at Rhizome on the 21st, one of my favorite people, David Shapiro, will be traveling through town on a tour supporting his solo fingerpicking material under the name Alexander. However, that night we will be doing a Nagual set along with Du.0, James Ilgenfritz's Trio (with Brian Chase of Yeah, Yeah, Yeah's fame) and Ami Yamasaki. If you can't wait for a gig, check out this really fun video of Nate Scheible and I performing in a secret part of Rock Creek Park last Summer. Thanks to Jason Coile for the beautiful footage & Nenet for the idea to film it! I hope you dig it! See you at a gig! I'll be continuing to ring in the new year with two massively fun gigs in February. The first is 2/4 at Rhizome DC. Heart of the Ghost (Jarrett Gilgore, Luke Stewart, and myself) will be on a bill with the mighty Ken Vandermark's new outfit as well as some incredible other acts including a duo between Brian Settles and Jeremy Carlstedt. Following that, Low Ways Quartet (Mark Cisneros, Anthony Pirog, Luke, and myself) will be performing in front of some new textile weavings that the incredible Janel Leppin has created at the Black Cat. There are a huge number of other acts that night which you can check out in the attached poster. There is definitely more to come (just not yet confirmed) so check in for more as the year progresses! Happy New Year! Here's to hoping 2018 brings good things. I'm very psyched to play this historic venue but even moreso because I will be in the company of 99 other guitar players. This is sure to sound colossal so check it out! The next day I'll be playing Rhizome with Heart of the Ghost. We're on the bill with Freestore, some freaky jazz school comrades from Oberlin who I am very excited to see perform. At the tail end of that week, I'll be playing solo on a bill with Nice Breeze and Jon Simler at Alexandria's own, Amma House. This is a fundraiser for Chethan Kenkeremath's Avant Fairfax revitalization efforts so it would be awesome to see some familiar faces supporting experimental music in Northern Virginia. Best tidings for the new year & hopefully see you at a gig! 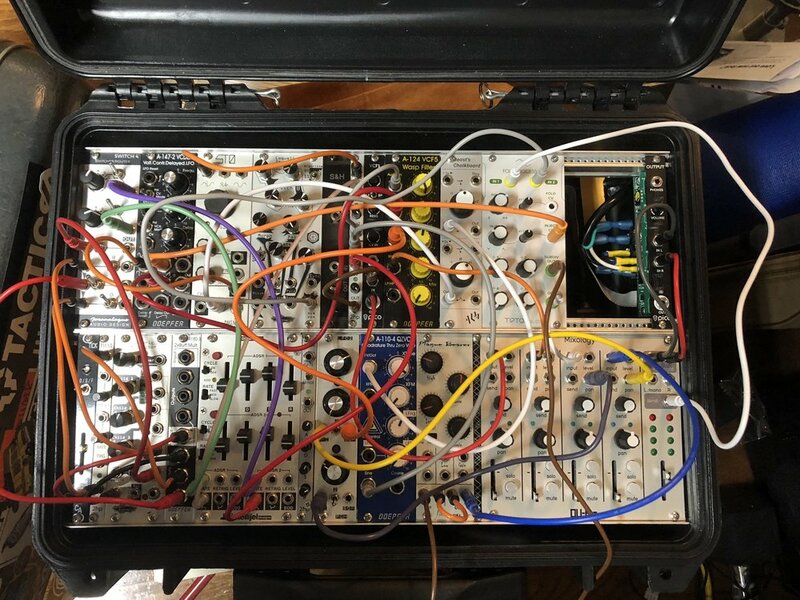 In addition to playing with the mighty Aaron Martin at Rhizome on Friday, I'll also be joining Luke Stewart & Anthony Pirog in a trio format at Showtime this coming Wednesday. We'll be performing freely improvised music in the absence of Mark Cineros and his usual compositions. Very psyched to be trying out this new trio formation in these last few gigs of the year.